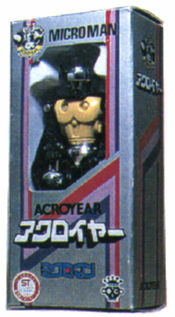 Sometimes called New Acroyear, it is essentially a re-release of the very first Acroyear figure with a cape added and some new colors. 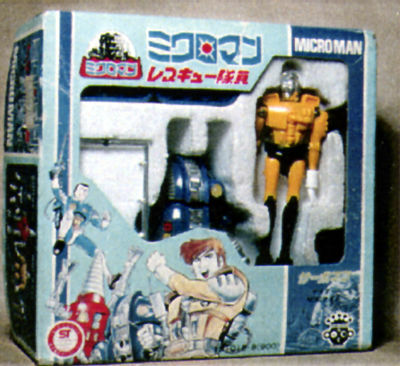 By 1979 Hoodman had been completely accepted as a Microman, so there was no need to keep the fleshtone face, the feature which helped in his recognition as Hoodman from the manga. 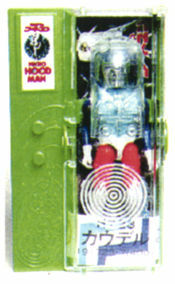 Heads are the familiar chrome, and the clear portion of the capsule featured concentric circles rather than the Hoodman logo. Hoods have a clear front and green back. 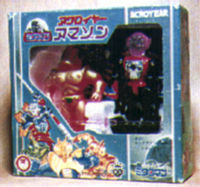 The Acroyear Amazons, perhaps the most desired of all Acroyear figures. 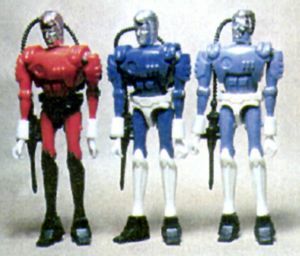 These figures use the same body as the A32X series, but with metallized chest plates. 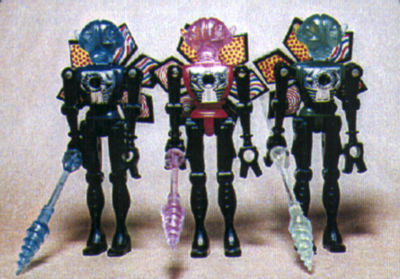 They carry a lance and their heads are translucent. The figures come with a lance and another vinyl figure, their cohorts. They have a pinwheel on their backs. Easy to find, but expensive because of their desirability. 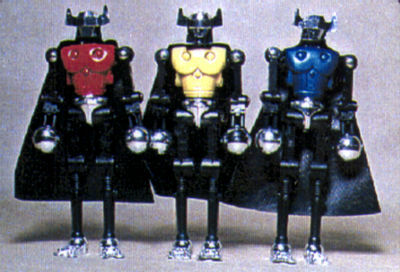 This is the main series from 1979. It is the first model from the Rescue group. 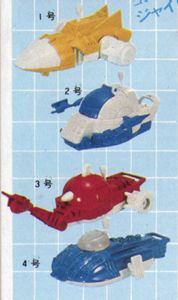 Vehicles and playsets were Takara's focus again that year, and accordingly the figures were simple. 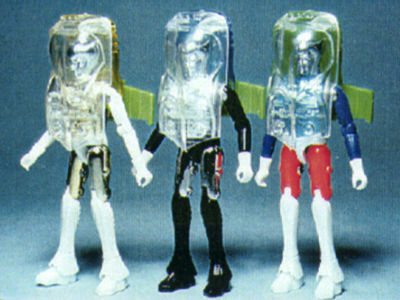 These figures feature the backpack/hose/handgun combo. 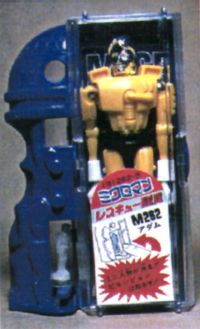 This model, which is also part of the Rescue series, was released in tandem with the M25X group and featured a new case which allowed the owner to tap a pedal with his finger, causing a tiny Microman in a tube to shoot upward. Also has the now standard pack/hose/gun combo. 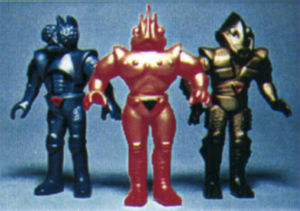 This group of figures was released along with the two sets described above. They have billy-club like guns. 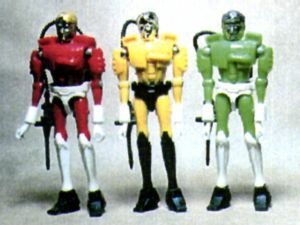 An interesting and increasingly credible rumor about this group of figures is that M273, 274 and 275 were released as a three figure set directly to major chains in the USA, with English language packaging. It is a fact that these three figures were released as a set in Japan, and that the other two were released individually in Japan. There are actually two figure sets depicted here (see below for individual pictures). 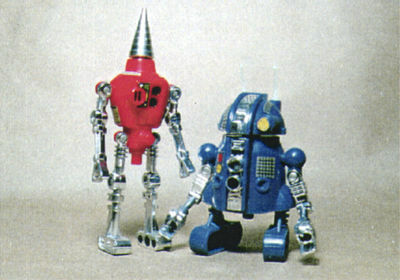 One is for the robot Data (the small blue guy) and the other is Missiler, the tall red guy. Missiler actually shoots his big missile head. Data comes with some very delicate antennae. 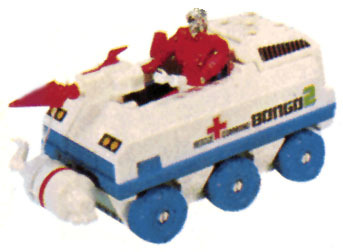 Each set (the two were sold separately) came with a member of the Rescue Command series in the box. I get the feeling that the kids who were able to buy this one bought it for the robot and not the figure. These are very desired sets, and they are escalating in price, though they seem to be relatively common in Japan. Each set cost Y980 (a bargain!) in 1979.